This is the third part of the guide of buying the executive condominium. In this post, I will be talking about settling the legal matters to complete the purchase. Read the previous posts on Guide to Buying an EC (Executive Condominium) for First Timer and Housing Loan in Singapore: Choosing between 1M, 3M SIBOR and SOR. 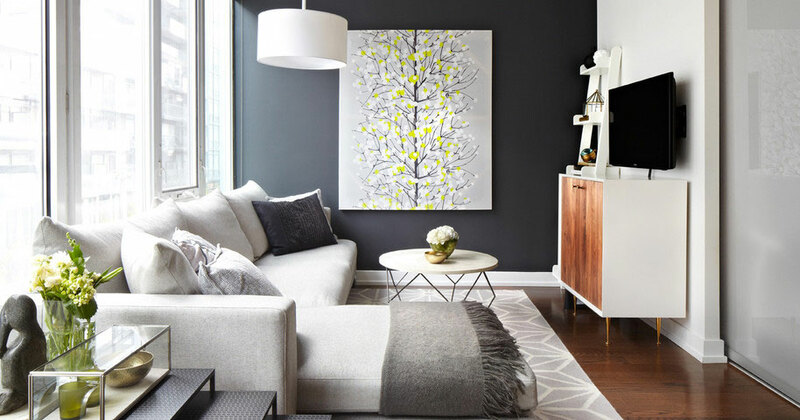 A living room design from Houzz.com. Plenty of ideas there. After paying the 5% down payment, there is waiting period of 3 to 4 weeks for HDB to grant the approval. As the EC is considered public housing, HDB needs to check if you and your partner's total gross monthly income is below $12k. Once they have approved, the developer's law firm will inform you. If HDB does not approve your purchase, the developer will refund you the 5% downpayment. Upon approval, HDB will mail you the details on the disbursement of the housing grant. If the grant is $10k, the amount is split equally among you and your partner. In this case, $5K will go into the CPF OA account each. This grant amount must be returned to the CPF OA account when you sell the EC. You need a lawyer (solicitor) to help you with conveyancing. Conveyancing encompasses the legal paperwork of transferring a property from the developer to you and granting the mortgage if you are borrowing from the bank. Choose a reputable law firm that is near your workplace or home. There is only a very short window to exercise the OTP (option to purchase) so you can arrange for 2 hours off work to visit the lawyer's office. The market rate for the lawyer fee at the time of writing is SGD $2500 and above. Your banker will give you a few choices from their own panel list. You can call them up to get the best price. The lawyer will need the OTP, your CPF OA balance and also to prove that you do not currently own a HDB flat. Once you have appointed your lawyer, inform the developer's lawyer to send the S&P to your lawyer's office. Alternatively, you can have the S&P delivered to your home. In the meantime, start preparing the cash for the stamp duty and lawyer fee. The stamp duty is typically in the range of $10K to $30K depending on the price of your EC. Ensure that your bank account has enough cash. When the S&P reaches your lawyer, it's time to go down to their office with your cheque book. At the office, the lawyer will work with you on the details of financing the home. If you are paying the 15% by CPF, you and your partner have to agree how to split the CPF withdrawal: it doesn't necessarily have to be 50-50. Next, the stamp duty can be paid in cash or by CPF. Even if you are using CPF to pay for the stamp duty, you have to write a cheque and pay for it first. Then the lawyer will apply to CPF to reimburse the cash you paid. It is very important that you have enough cash for the stamp duty. When it comes to the monthly payment for the house from CPF, you can choose how to split the payment. Most of the time, you will go with a 50-50 payment: it gives both parties a sense of responsibility and ownership. You can change this anytime on the CPF website under the Request > Property section. The property can come under different type of ownership. There is Joint Tenancy with Right of Survivorship where you do not have to write a will and the property to go the surviving owner upon death. Tenants in common means each party holds a percentage share of the property and the ratio will be decided between you and your partner. If there is no will in this case, the share of the property will be given out according to the law of intestacy. You can also be sole owner of the property if you paid for the house. To avoid confusion, discuss this with your partner before visiting the lawyer. Once you have decided, you will sign an agreement on the ownership of the property. Finally, you have to write a cheque to your lawyer to pay him/her. Once again, ensure that you have sufficient cash. If don't, backdate the cheque to your next salary date. For the remainder of the time, the lawyer briefed me on the S&P (Sales and Purchase) agreement terms. I will state the salient points in the 30-plus pages of the agreement I received. Upon completion of the unit, the land surveyor will produce a title of survey to state the unit's floor area. If the final area is reduced more than 3% more than the original, there will be reduction in the unit purchase price that is in excess of the 3%. Anything that is less than the 3% error is your loss. For example, the floor area that you agree to buy is 110sqm. The developer can build a unit that is only 107sqm (2.7% less than intended) and they do not have to compensate you. If you paid $900K for that unit, it is a loss of approximately $24.5K. The cost of title surveys and strata certified plans is split evenly between you and the developer. To find out more land survey, this is an interesting FAQ from the SLA. The first 6 months of maintenance charges (inclusive of GST) needs to be paid in advance to the developer. Subsequently, 3 months of maintenance charges will be paid in advance. This happens until the management corporation takes over. Payment to turn the water and electricity supply is the owner's responsibility. There is a defects liability period of 12 months from the date that the unit is delivered. No alteration to the unit is to be done until after the CSC (Certificate of Statutory Completion) has been issued for the unit unless you have approval from the developer. From what I gather on the Facebook group postings so far, the developer has rejected all requests for alterations such not installing the wardrobe or toilet bowl in the WC room. Finally, there are restrictions on the use and enjoyment of your property. It can be hard to believe that after paying so much, they are going to tell you what you cannot do. You cannot use fuels that will result in smoke, fumes or obnoxious odour. I guess that means no BBQ, no farting and no smoking in your own house unless you have industrial HEPA air filters. Here's another one: you cannot "hang or dry or permit the handing or drying of any clothes, linen, washing and such like articles beyond the strata unit area". That means no HDB-style of hanging your clothes on bamboo poles and extending it out the window. The terms and conditions of your property will be different from mine but the differences will not be very far off. Once you are satisfied (not necessarily happy), you can sign the three copies of the S&P Agreement and the lawyer dispatches them to the developers. You will get a photocopied copy via mail for your own keeping. The valuation report is an assessment by a third party to determine the fair value of the house. This is used by the bank and CPF to ensure that the transaction price is within the threshold of a fair value. If you agreed to buy a property at price that is 2 times higher than the market rate, the bank will not loan you based on the sale price. In the event of a default, the bank will fail to recover the loan amount even after the selling off the property. Your banker should arrange the valuer to generate a valuation report and send it to your lawyer. This cost of a valuation report is about $214 inclusive of GST. The valuation report needs to reach your lawyer on time so that the report can be forwarded to CPF to authorise the withdrawal of CPF funds. If the withdrawal is late, the downpayment to the developer becomes late and the interest is chargeable daily according to the rate in your S&P agreement. Once successful, you will receive a letter from CPF informing you of the withdrawal. Within the next few days of payment, you will receive a letter from the SLA that a caveat is lodged against your property. As the property is mortgaged, the bank has an interest in your property which gives them the right to sell in the event of a default. If you paid for the property in full, no caveat will be lodged. The caveat has a serial number with the bank as the caveator and the caveat lodged by the law firm. If you are not in shock of seeing this, no action is required from you. You can further confirm that the caveat is lodged by checking URA e-service for your unit. There, I have mentioned all the legal aspects of buying an EC. The same should apply to other residential property purchase too. I update this post if there are any changes.